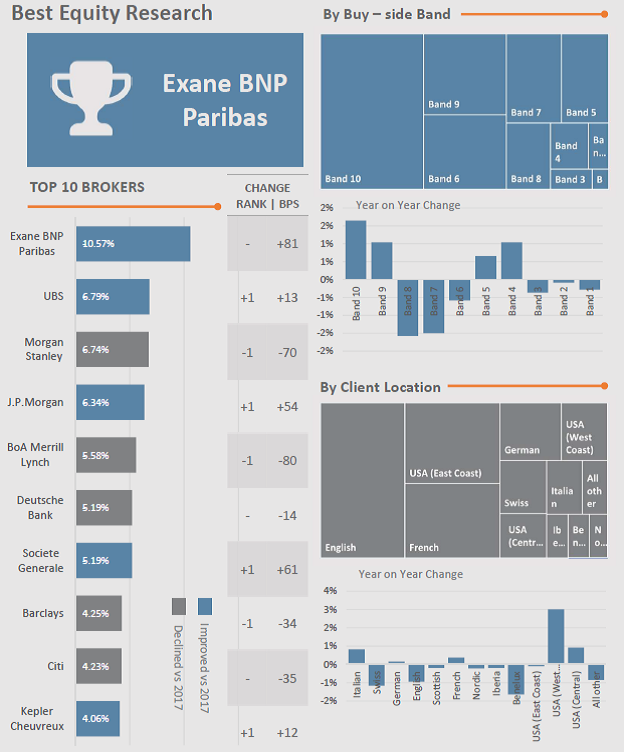 Exane BNP Paribas dominated the 2018 Extel survey, retaining its top equity research and sales rankings and claiming the categories of best overall broker and best overall research. Absolute Strategy Research remained the top independent in the survey. Despite MiFID II, there were no seismic changes to the top standings. Exane had a steady progression over the last five years in its march to the top equity research spot, upending Morgan Stanley in last year’s Extel survey. Morgan Stanley fell to third place in the latest survey, displaced by UBS which rose to second from third last year. JP Morgan, Société Générale and Kepler Cheuvreux slightly improved their standings in equity research, while Bank of America Merrill Lynch and Barclays slightly declined. Despite its turmoil, Deutsche Bank held steady in the 6th position. Credit Suisse, which fell out of the top ten last year, remained absent. Extel was acquired by Euromoney, parent of rival Institutional Investor, in March 2018. Unlike II’s surveys, Extel weights survey votes by commission spending. This year it provided detail on net percentage votes received for top finishers, showing the strength of Exane’s equity research lead which is nearing 400 basis points at 10.57% of voting compared to second place UBS at 6.79%. This year’s survey added a new category for ‘Best Overall Research’, where the winners largely tracked the equity research results after votes for research from other asset classes were added. SocGen jumped from 7th in equity research to 5th in overall research, Kepler Cheuvreux moved from 10th to 7th and HSBC displaced Barclays in the top ten. Extel’s ‘Best Overall Broker’ category was also dominated by the same top four which prevailed in equity research (Exane, UBS, Morgan Stanley and JP Morgan) with Kepler Cheuvreux, which won Best Overall Sales and Best Corporate Access, in fifth place. Absolute Strategy Research dominates Extel’s Best Independent Research award, adding another 263 basis points to its score. (Strangely Extel does not consider Redburn or Autonomous Research as independents.) Given the small shares that most independents have, the IRP rankings tend to be volatile. In the 2018 rankings, Gavekal Research came in second followed by New Street Research, both of which gained significant voting share. AlphaValue, BCA Research and TS Lombard lost rankings but remained in the top ten. 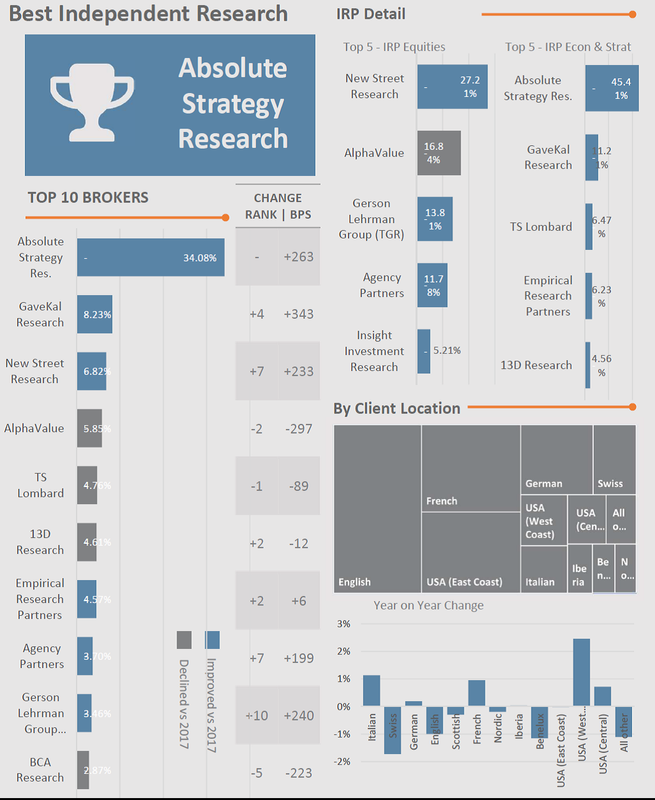 When we look at the historical rankings, we see significant improvement for GaveKal, New Street Research and expert network GLG (Gerson Lehrman Group) which rejoined the top ten after a hiatus since 2014. Meanwhile, the tribulations afflicting BCA Research, now a sister company of Extel being jointly owned by Euromoney, are apparent. Extel’s pan-European survey received votes from over 2,600 fund managers, 240 brokerage firms and over 1,100 quoted companies worldwide, with a total of 11,333 professionals taking part. The survey was held over six weeks between the 14th March 2018 and 27th April 2018 collecting over 1.28 million votes in total. The 2018 survey looked back to 2017, prior to the implementation of MiFID II’s research unbundling provisions, which perhaps explains why there were no major changes to the rankings. Extel noted that fewer brokers were recognized by investors and the decline was across all types of brokers – global, regional and local. The effect was most pronounced among the largest investors (those spending $30 million or more in commissions) as they prepared to implement MiFID II. Extel also said that participation by the smallest asset managers fell, perhaps because they are forgoing external research and/or are being cut off by brokers. The 2019 results will more fully reflect the impact of MiFID II.